Recently, I wrote with some ideas for filling America’s vacant retail spaces. CLICK HERE to see that post. Dear Readers, I now report that the vacancy problem is solved, at least temporarily. Drive with me, if you will, a 6.4 mile stretch of the trip home from work. We begin on Hawthorne Blvd. in Torrance, nearing the southbound intersection with Pacific Coast Highway. The route we will take goes through the LA suburbs of Torrance, Lomita, San Pedro and Rancho Palos Verdes, all more or less representative of where millions of Angelenos live and shop, and all affected to varying degrees by the economic downturn. Here we are a few blocks south of the massive Del Amo mall and the vacant retail space I featured in the blog referenced above. 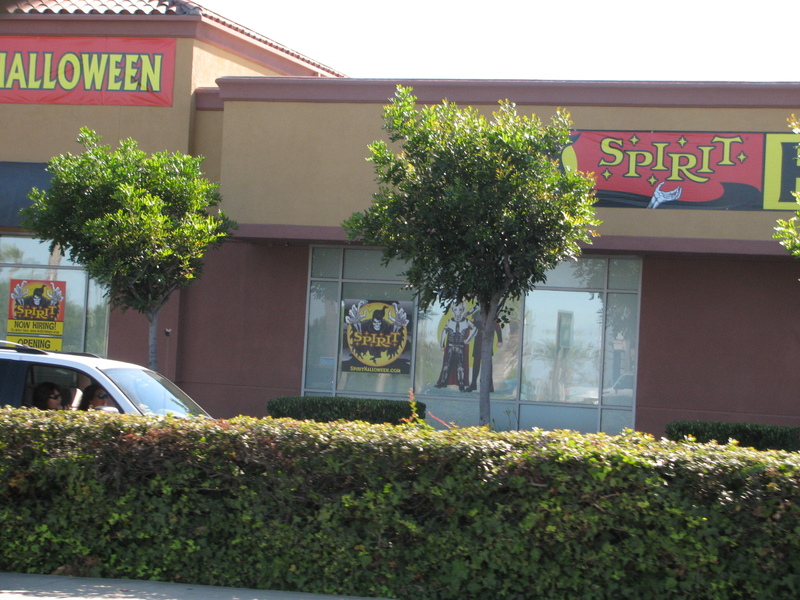 It’s a Halloween store, offering costumes, masks, decorations and ghoulish stuff for the coming holiday. We’ll call that store #1. Then, without any further driving, walking less than a block, let’s go four doors to the south. 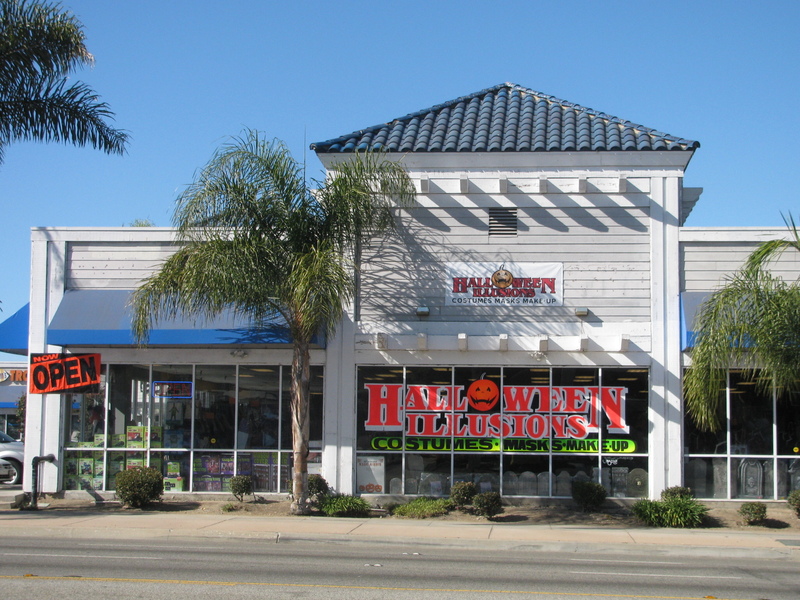 Imagine that, another Halloween store, perhaps 150 feet from #1. OK, that’s #2. Now, we’ll continue south on Hawthorne, make the left turn onto PCH and head east for about a mile. 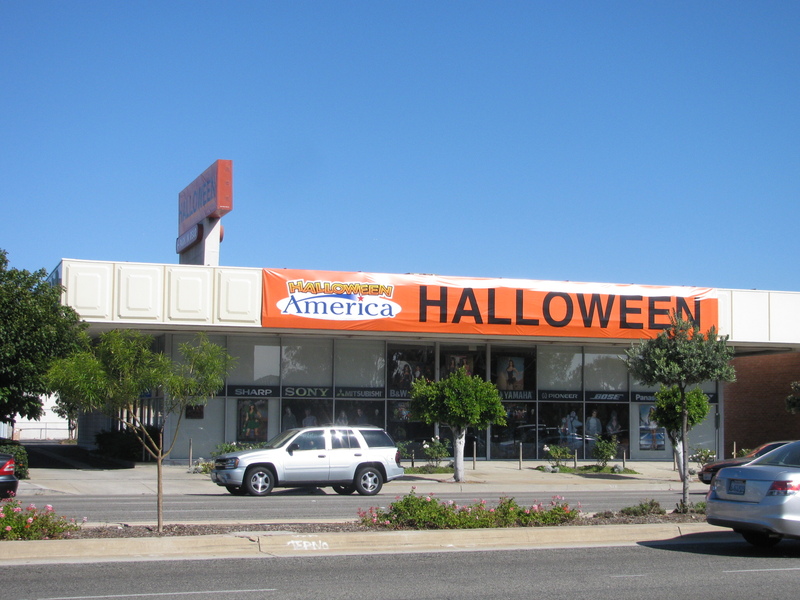 Dang, a Halloween store. Imagine that. #3. I apologize that I had to grab this shot as I drove past. I forgot it was there, and was in the wrong lane to make a turn. Okay, let’s go another mile or so, now into Lomita, still on PCH. Are these Halloween Illusions … or delusions? It’s outlet #4. 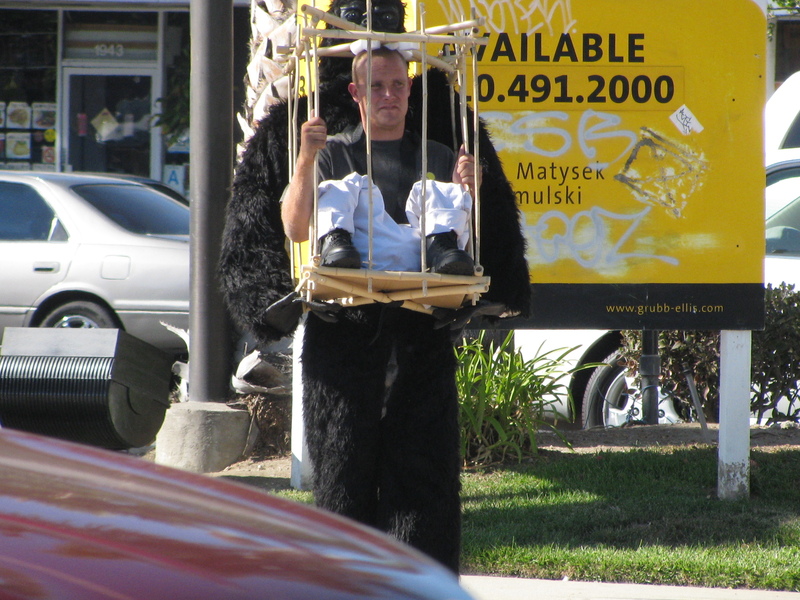 Like most of these places, Halloween Illusions has the inevitable costumed sign-waver out front, and this guy’s costume was the BEST. Number Six! 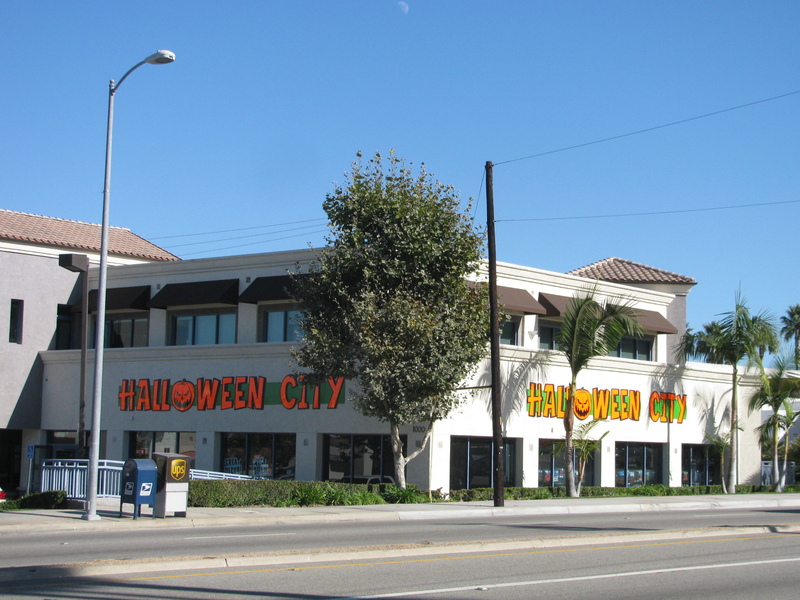 Six Halloween stores in 6.4 miles. 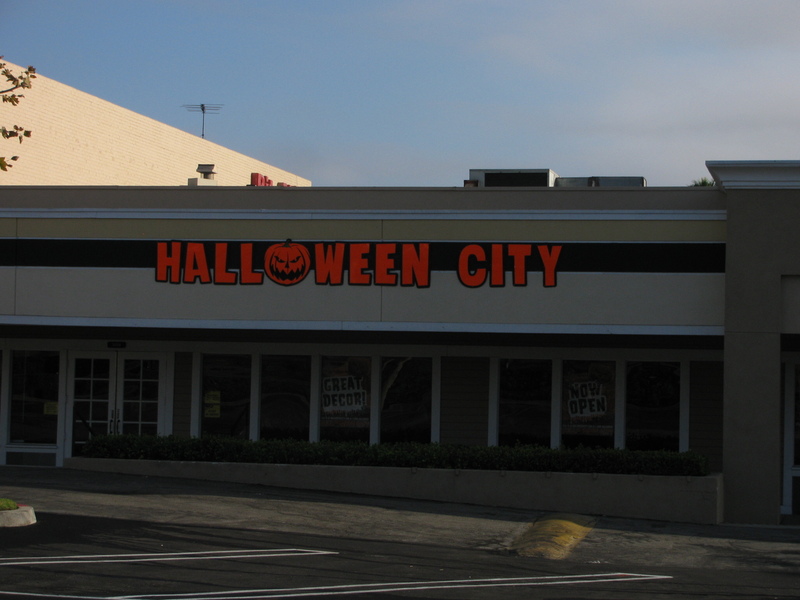 Goodness knows, you NEVER want to be more than about a mile from a Halloween store, or you just can’t consider a place civilized. 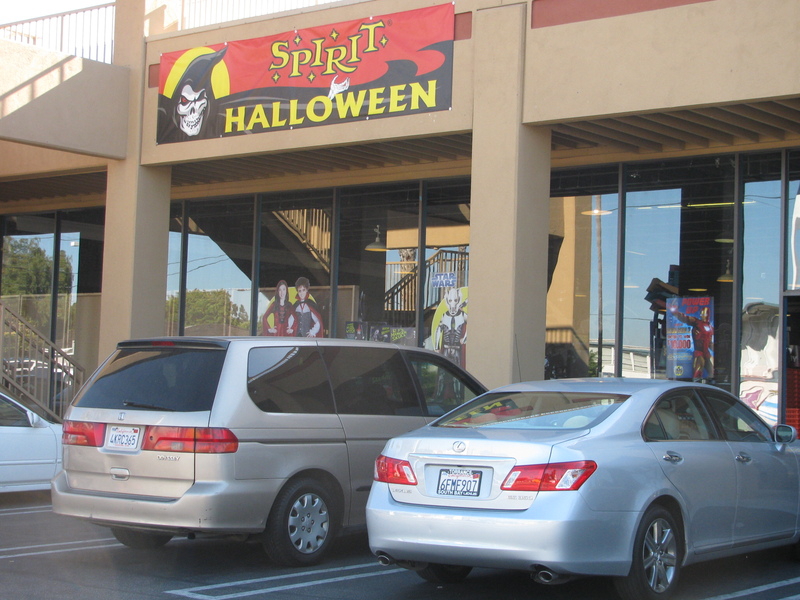 To grab as much market share and brand recognition as possible, these places have pushed their opening dates two months before Halloween: the first of these stores opened on August 31, and all the others were open within days. What’s next, a year-round Halloween store in Frankenmuth, Michigan, to compete with the legendary Christmas store (please do not tell me if there is one)? No one grabbed the big department store I featured in my previously mentioned “megastore” blog, I’m sorry to say: probably too vast. #3: a closed electronics store. #4’s in a former Hollywood Video. #5 is in a mattress store that moved into the SAME space that #5 occupied last year. 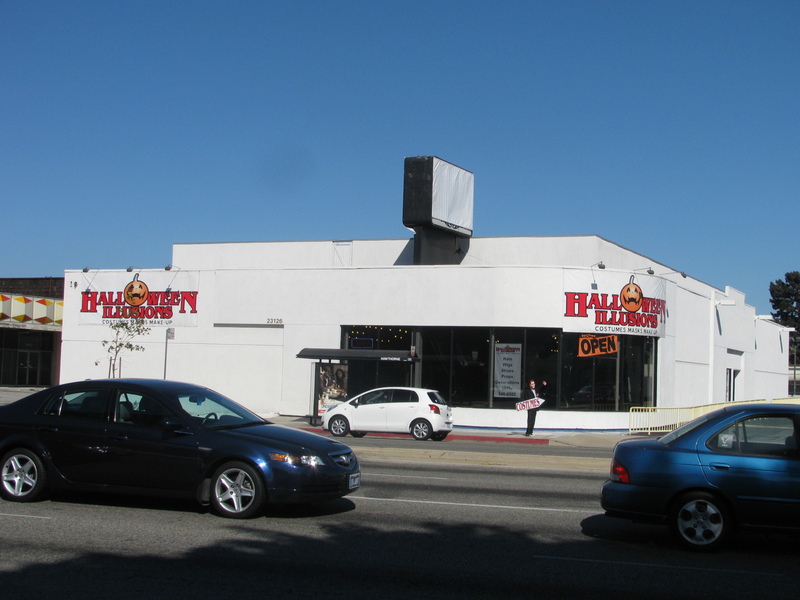 And #6 is in a former Hollywood Video store, too. It’s a perfect storm for video rental and electronics/entertainment hardware: burgeoning Internet, crashing economy. Expendable income has either disappeared or, where it persists, has moved online. Oh, man. Now, if the State ran video stores, they’d still be open, except, of course, all you could rent would be Terminator movies and probably Ronald Reagan’s entire career output. At least here in California. I know that you don’t come here to get my opinions; you want interesting or funny or even though-provoking material, but, really, folks, a 60-day period of preparation and buildup for Halloween? Where does this come from? Are we that starved for meaning in our lives? Aren’t the World Series and the football and campaign seasons enough for Fall? I just don’t get it. Are you one of these Halloween People? 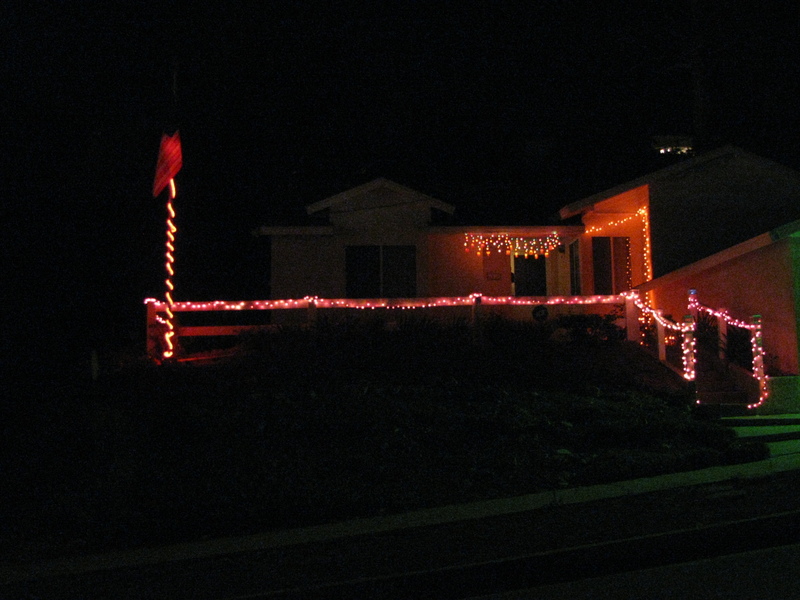 All trimmed out for that traditional holiday house-decorating holiday, Halloween, in mid-September! I’m already dreading the November-December Holiday Season, which will, of course, begin on All-Saints’ Day, the day after Halloween. Now, it’s become an unrelenting churn of retail holiday madness that consumes five full months. I’m tired. I want to make it clear that I do not object to Halloween on any wacky pseudo-religious grounds. I like Halloween, itself. I just don’t want to spend two months observing it. I like Beggars’ Night, too. I always thought that was the whole point, and that there just wasn’t much more to it. I like it when all the goblins and princesses show up. We get nice kids here and almost all of them have been strictly schooled to say, “Thank you,” even if they have no idea what it means. I only dread the fact that we are SURE to have someone in a Sarah Palin mask, and THEN I’ll be afraid. Very afraid. After this was posted, I realized I had missed a store. We’ll call it 3A. For more details, scroll ahead to a post for September 20th or CLICK HERE. « I Told You Not To Heedlessly Split That Infinitive!